Why not grow sunflowers with kids? Sunflowers are gorgeous, draw pollinators, look gorgeous, make food for birds, and are edible. You just need a few sunflower seeds, a patch of dirt and plenty of water and sunshine to grow a great sunflower garden. 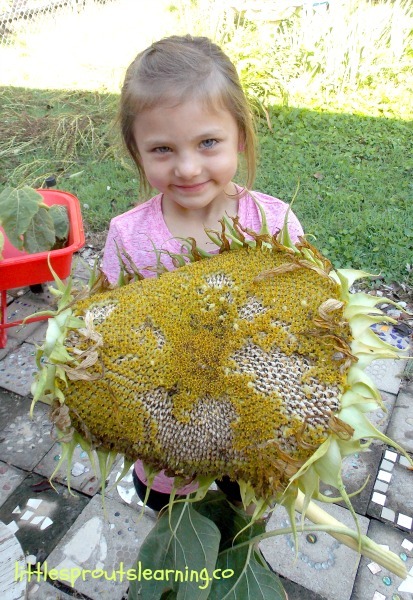 We grow quite a few sunflowers at little sprouts. We like growing the biggest ones we can find. My Little Sprouts LOVE growing things that are the biggest or the tiniest. We ran out of time and money in the expansion for trellising materials, so we grew several rows of sunflowers for our drying beans to trellis on. 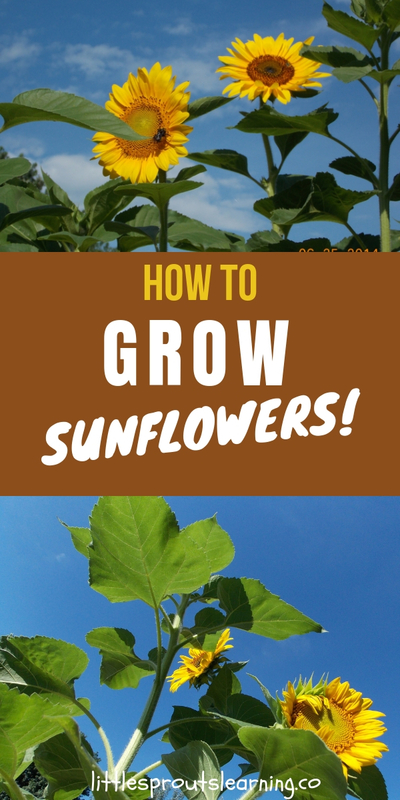 Since we tried this technique, we have learned that sunflowers inhibit the growth of a lot of other plants, so it’s a good idea to grow them separately. 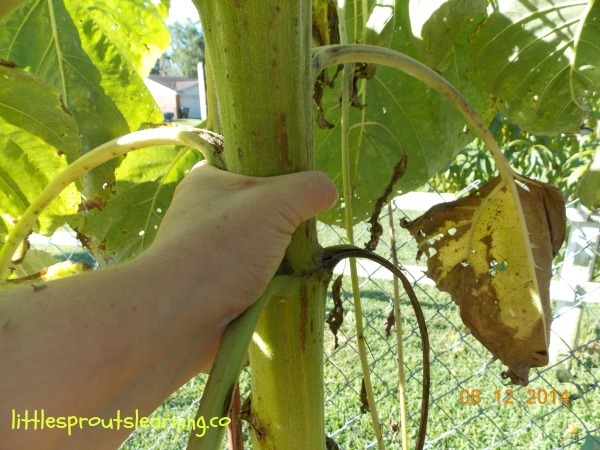 A cool thing a sunflower garden does is remove heavy metals from the soil. So if you are gardening in an urban area that may be contaminated, grow sunflowers the first year for safer soil. 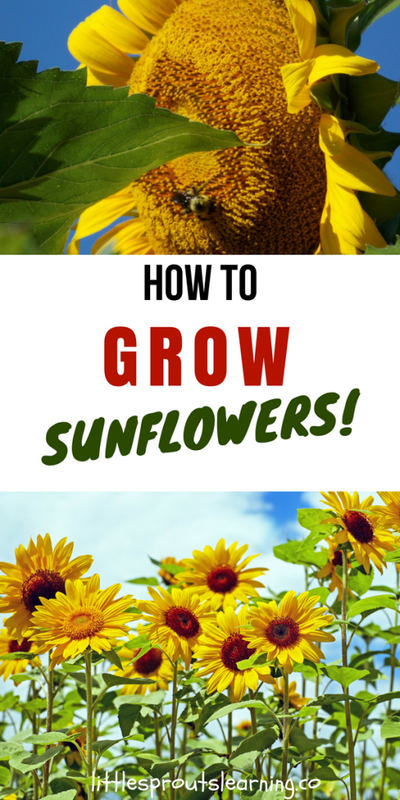 Growing a sunflower garden is fairly simple. You need good, loose soil and access to water. They like a lot of sun, so make sure your space has 8 hours of direct sunlight per day. Poke a hole in your soil up to your first knuckle. 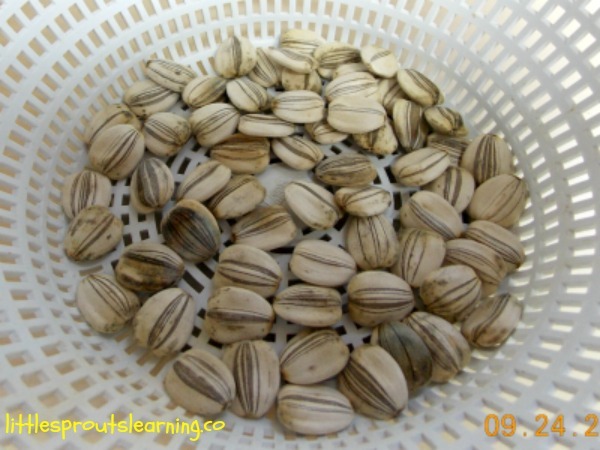 Place a sunflower seed in the hole and cover it. Pat it down no harder than you would rub your eye. Water well and keep moist until it sprouts. Sunflowers are drought tolerant once they are established and they tolerate extreme heat very well. 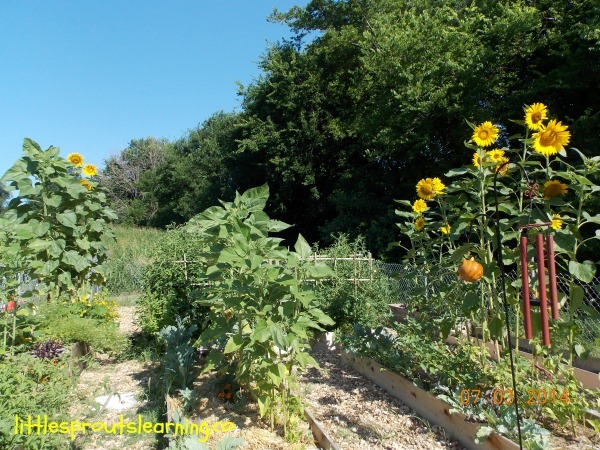 Plant your seeds in the sunflower garden at least 6 inches apart. Different types of sunflowers will grow different heights. They are all pretty tall though, at least 4 feet for most varieties. Our largest sunflower ended up being 14 feet tall! The stalk was as big around as a tree trunk. And the head was about 14 inches across. The kids were amazed, as were many garden visitors we had. 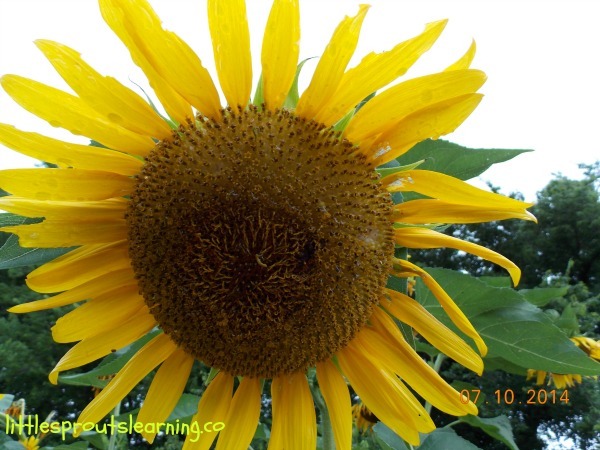 Birds and bees and other wonderful garden creatures LOVE the sunflower garden. 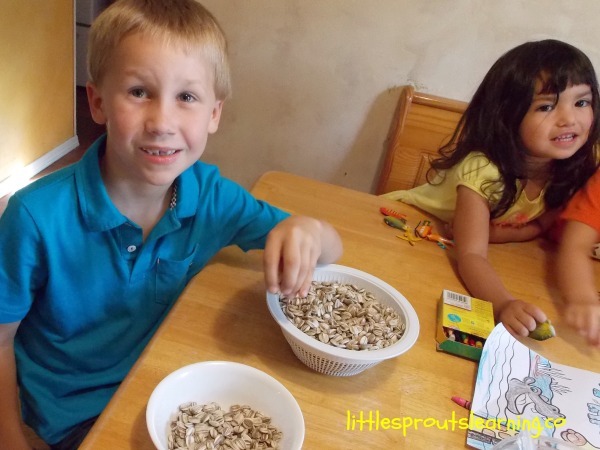 We dry and harvest our seeds to make birdseed for the winter. 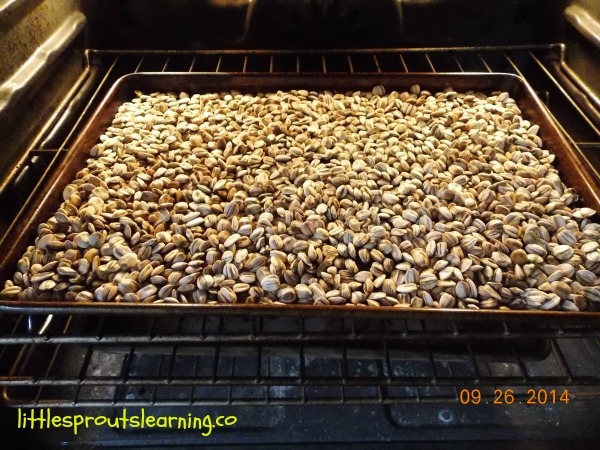 We wanted to keep some of our seeds to brine, roast and eat. When the seed heads began to droop over in the sunflower garden, we had some ornery birds who didn’t want to share the seeds. 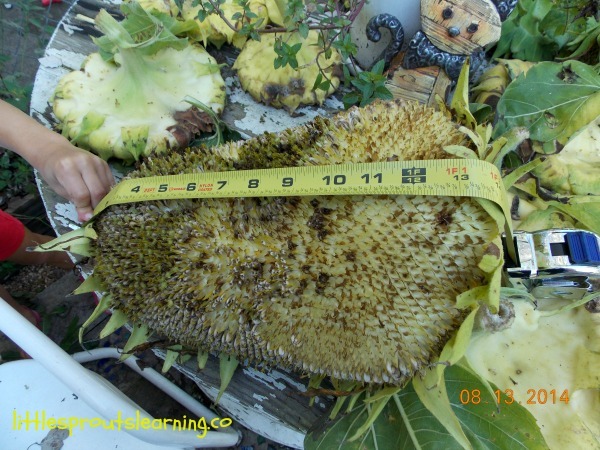 We cut the heads off of about 2/3 of the large sunflowers and put them on a screen in the shed to dry. We left the rest for the birds as well as all the smaller flowers. Sunflowers go in the ground when the danger of frost has passed. You can plant them directly into the sunflower garden. They don’t love being transplanted, so I suggest if you don’t have to, don’t start them indoors. In Oklahoma, we plant most flowers including sunflowers between April 15 and May 1. 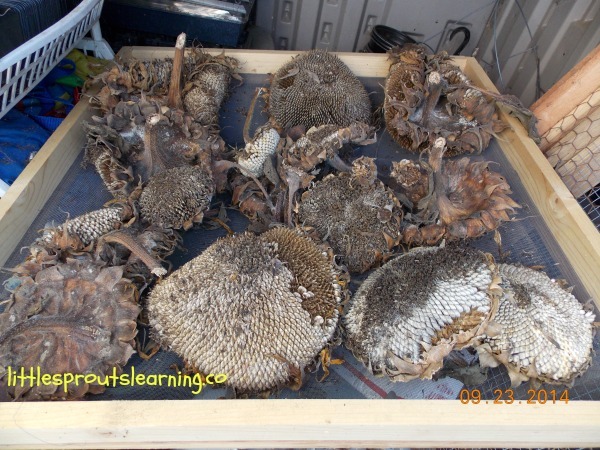 We dried these sunflowers in our shed on a drying rack for about a month. When the backs of the heads turn brown, you know they are ready to harvest. We love removing the seeds. It’s great fine motor skill building. Some of the kids wanted to pick seeds for a while, and some wanted to do it for a long time. We did it next to the playground so they could come and go as they wanted and we could keep working. We ended up with about a half a bucket full of seeds and pieces of seed head. Next, we sorted the debris from some of the seeds. We saved the rest for bird seed for the winter. Then we made a bowl of salt water to soak the seeds in overnight. We used 8 cups of warm water and 1/2 cup of salt. Next time, I will probably double the salt. They were good, but store-bought sunflower seeds are much saltier and more salt would make them taste more familiar. 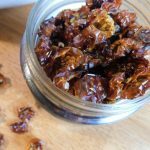 The following day, we drained the seeds and roasted them at 300 degrees until they were slightly darker, dry, and tasty. It took about 30 minutes. Then it was time for tasting. The kids loved them. We packaged up the rest of the seeds, and each of the kids got to take some home to share with their families. 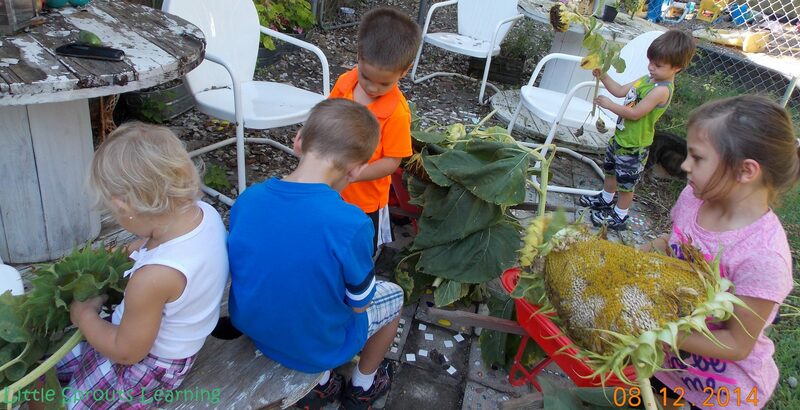 The kids LOVED this sunflower garden project. How fun! I might give sunflowers a try next year. Thanks for sharing this fun experience with your kids. You’re welcome, i’m glad you enjoyed it. It was very fun for us all. Thanks for reading! WOW! Just wow! 14 feet tall! That’s what we thought! Thanks for reading! How fun. 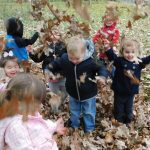 I love the idea of getting kids out in the garden and engaging them. It may instill in them a life long love of gardening. Great post! I sure hope so! That’s my goal. Thanks! Thank you. 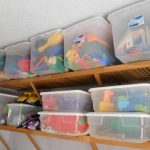 I try to give them as many sensory experiences as possible for life long learning. Thanks so much for reading! Those are some huge sunflowers. It’s great that the kids get in the garden and help out. 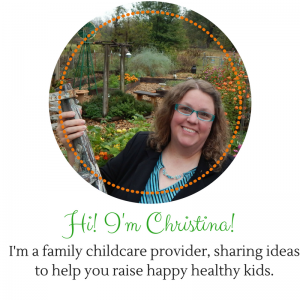 It’s the best way to raise healthy eaters. Sure is. They are much more likely to try something they grew. There is proof in what my preschoolers eat. 🙂 Thanks so much for stopping by. Oh my gosh! I love how many kids are helping out and learning about growing food! Thank you. It’s my dream to teach the future to grow food. 🙂 Thank you so much for reading! I think we had that kind, but sadly, like I always do, I forgot which were which. :/ I always think I can remember, but then I don’t. 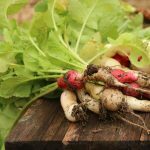 🙂 My gardening shame! Thanks for reading! Awesome information! Sounds fun! It’s cool how much the little ones can learn! Can’t wait till next year and we can do it! I’m so glad! 🙂 It was really fun! Thanks for reading.